There are two basic modes of communication: wired/cabled and wireless. In wired communication, data cable must be run from the shot clocks back to the operating control for the shot clocks at the time keepers table. Depending on the type of scoreboard you have and the control features, the shot clocks could be operated from your scoreboard control, or if that capability does not exist, they will operate from their own dedicated control. In wireless communication there are no data cables but strictly wireless receivers installed near the shot clocks and a wireless control for communicating. 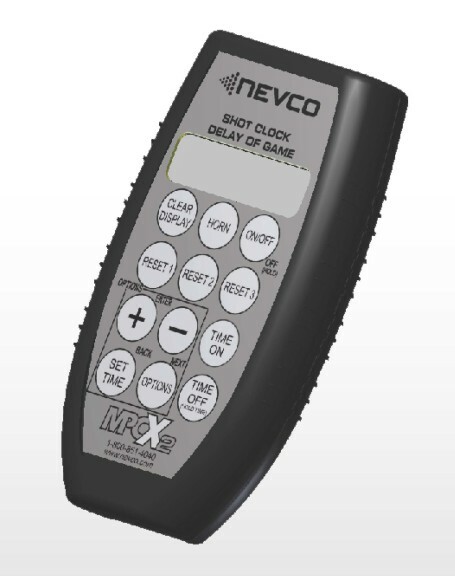 If you have a Nevco scoreboard currently in your gymnasium, and it is a table top wireless unit, then this control is already preprogrammed to operate your shot clocks. All you require are two (2) receivers to be mounted near each of the shot clock. 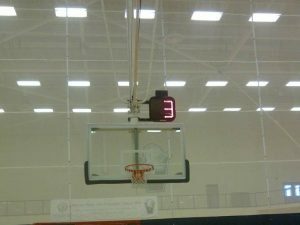 If by chance your scoreboard is within 100 feet of any one of your shot clocks, than the closest shot clock can be linked to operate off of the receiver on the scoreboard so only one receiver has to be purchased. The linking is done with a run of data cable from the scoreboard receiver back to the shot clock. We also have a second wireless system that is called the MPCX2 hand held portable control system. This wireless system has a hand held portable control that is powered by two double “A” batteries and linked to the receivers on each shot clock. This system operates totally independent of your main operating scoreboard system. 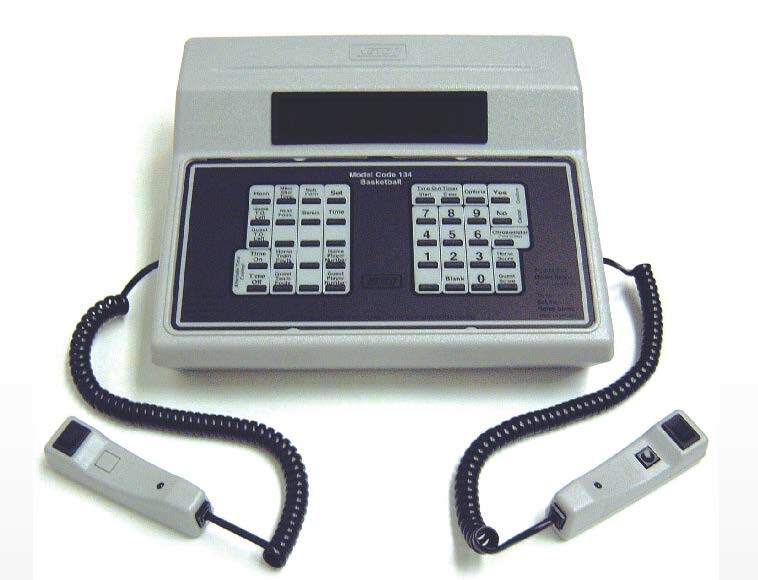 If you have a Nevco scoreboard that is a cabled unit, and you would like to convert it to wireless, that can be done, and you can pick either wireless option, the table top wireless (W-7), or the portable (MPCX2) system. If you wish to have your scoreboard and shot clocks operated from the one control, the table top W-7 option is what you would choose. 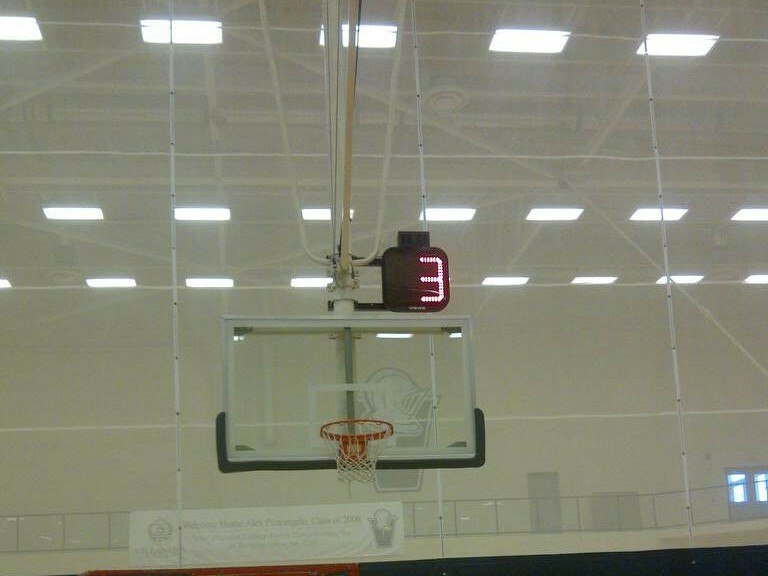 Portable shot clock set ups mean you have to have a safe storage area for the clocks when they are not in use. Also, there is the risk of damage every time you have to bring them out from storage and set up. Used portable generally means corner locations on the gym floor which presents a risk for tripping over if your out of bounds area is limited in space. Also, power cables strung along the floor to the closest power outlet also poses a safety risk. Two options are: wall mounted or backstop mounted. Wall mounted option: This is generally the simplest and most inexpensive option. Limitations to this type of install exist when there is only one solid wall in the gym, and the other back wall where the shot clock would be located is a folding wall, divider curtain, stage or other obstacle. Backstop mounted option: This is the most desired option from the standpoint of visibility for the players, coaches and fans. It is not always possible due to certain structural limitations the backstops may possess. The best install for backstops is where the backstops are ceiling suspended single mast style backstops. Generally with the mast style backstops you are able to mount the shot clocks off to one side of the mast directly above the backboard. With the other style of backstops, frame structure, the options are more challenging and often require additional structural support welded or bolted to the frame work to accommodate installation. 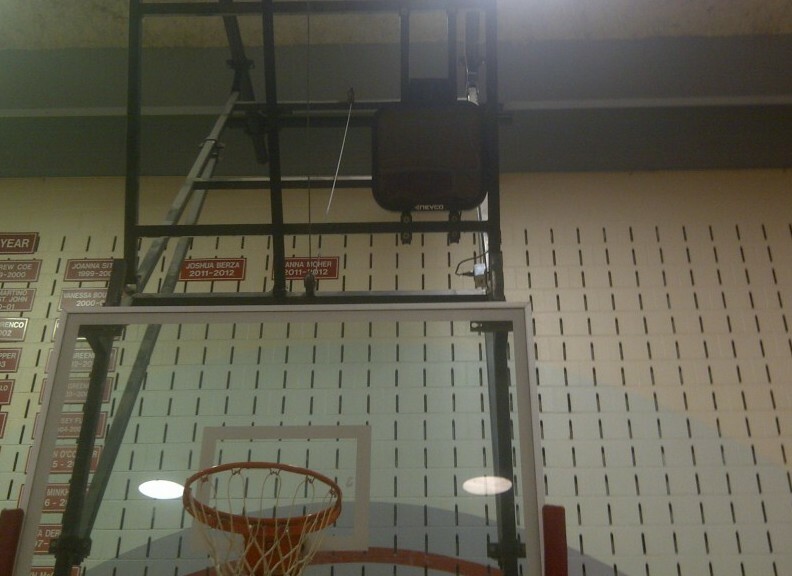 The shot clocks could end up installed off to one side of the framework or possibly within the framework structure itself above the back board. SHOT CLOCKS: Cost will depend upon the model you decide upon. Do you wish to have just the shot time displayed, or would you like both the shot time and the game time displayed on your shot clocks? COMMUNICATION SYSTEM: Will you choose wired communication or one of the wireless options? Wireless is recommended. INSTALLATION: Where will your shot clocks be installed, on the walls or on the backstops? POWER REQUIREMENTS: Each shot clock must be connected to a source of power. Power locations for the shot clocks are seldom convenient. Quite often the source of power may become the determining factor for the installation location. Please call our office at (800) 363-8196 to determine the best set-up for shot clocks at your school.